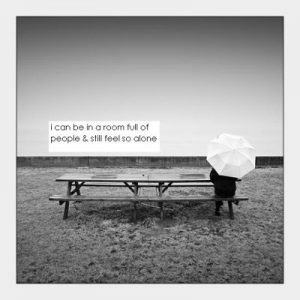 Loneliness is an emotion which we have all likely experienced at some point in our lives. The feeling of being alone with no one to turn to is something many of us can relate to, and it can be easy to feel alone and unappreciated as we try to keep up with the ever-increasing demands of modern society. When we talk of loneliness, what exactly do we mean? When we think of someone who is lonely, we may think about someone living on their own, an elderly person with no family, or a child playing by himself in the school playground. Loneliness can cover a range of different emotions, and while it is most commonly associated with being alone, being lonely is a very different thing from just simply being on your own. The idea that we can still feel lonely even when surrounded by other people effectively highlights the difference between being alone and feeling lonely. We can experience loneliness even when we have a network of people around us. Therefore, feeling lonely is not necessarily a result of the people who are around us, but rather our own state of mind. It is the perception of being alone, unloved or unappreciated that makes us feel lonely, regardless of whether our perceptions are correct. Isolation, e.g. moving to a new area where you don’t know anyone. Experiencing discrimination, e.g. being excluded from an activity due to disability, race, gender, etc. Feeling you don’t ‘fit in’ with those around you. Get in contact with friends and/or family- even just a phone call, text or email to a loved one can remind you that you are not alone, and there are people in your life who care about you. Go outside- take a walk, go to the shops, or go for a coffee. Regardless of where you go, being outside allows you to be in the company of other people, even though you don’t know them. Simply being with other people can help you to feel less lonely. Join a group- joining a group or activity which interests you will put you in touch with like-minded people who have similar interests. It will also give you something to focus on, which can combat feelings of loneliness. Start a conversation- whether you simply say hello to someone in passing, or you have the opportunity for conversation with someone, take the opportunity to talk to people. This can feel daunting if you are nervous in social situations, but the more you do it the easier it will be, and as you grow in confidence you may find that your social skills will improve and this will allow you access to a wider social network. Learn to be by yourself- learning to be comfortable being alone at times is very important. Being alone can be a very positive experience, and learning to see the positive side to being on our own will allow us to enjoy our alone time and benefit from it. If you feel unable to cope with your feeling of loneliness, talking to a counsellor could help you move towards a more positive future. Ask us for a free consultation and take the first step towards feeling happier and more confident. Even with limited finances and/or time, counselling can help you make huge changes for the better.